Asked for his response to the verdict, the former Massey Energy CEO just winked. Don Blankenship fell from quite a height. Five years ago, the former Massey Energy CEO had the West Virginia coal industry in his pocket, along with a fair number of the state’s judges. He’d put the coal miners’ union under his foot and crushed it. Adhering to an ideology of “survival of the most productive,” he had a mountaintop mansion and made $18 million a year, while his mines racked up of hundreds of safety violations. Then, one April afternoon in 2010, an explosion ripped through Massey’s Upper Big Branch mine, killing 29 workers. It was the worst mining disaster in four decades, so bad that even the King of Coal couldn’t fully get away with it. 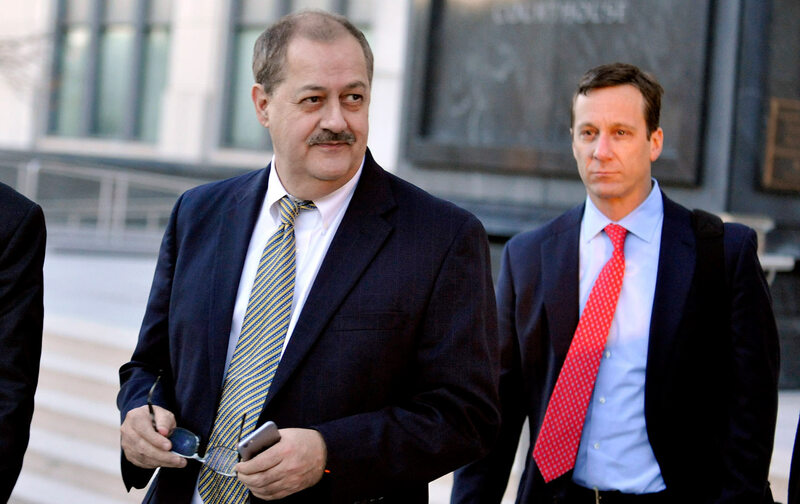 On Thursday, a jury in Charleston convicted Blankenship of conspiring to violate mine-safety regulations at Upper Big Branch. He was acquitted of two more serious felony fraud charges. Blankenship faces a maximum penalty of one year in jail and $250,000 for the misdemeanor—equivalent to the maximum prison time for excessive littering, and far less than the potential 30-year sentence had he been found guilty on all counts. Still, US Attorney Booth Goodwin called it a “landmark day for the safety of coal miners.” Asked for his response to the verdict, Blankenship just winked. Don Blankenship's conviction is a pitiful sort of justice, but historic nonetheless. “Hardly nobody would talk,” even after the disaster in 2010, testified former operator Stanley “Goose” Stewart, who broke down in tears on the stand. “I said, ‘I’m going to speak up. I’m going to tell the truth.’” Shaun Ellison, another UBB worker, told of being unable to see in the “dusty and dark” air of the mine, and of being pressured by supervisors to tamper with equipment meant to monitor safety conditions. “There wasn’t enough ventilation [at UBB] and they knew that,” Ellison testified. “The pressure was always there to produce.” Rick “Smurf” Hutchens said supervisors ignored his warnings about high methane levels, deep water, and other hazards. When he took time to deal with safety issues, he was criticized for slowing down production, he told the jury. “I was always pressured that I wasn’t running enough coal,” Hutchens said. Blankenship’s conviction also offers a symbolic marker for the end of Big Coal’s economic dominance, not just in Appalachia but throughout the United States. At least half a dozen major coal producers have gone bankrupt this year. Alpha Natural Resources, once one of the largest, went belly-up in July, citing “an “unprecedented period of distress” across the industry. Arch Coal may soon follow. Coal still has any ally in the GOP—Republicans in the House and the Senate passed measures this month to nullify the White House’s Clean Power Plan—but investors are fleeing, demand is peaking in many parts of the world, and it’s unlikely coal’s downward spiral will reverse itself. With renewable energy becoming “a mainstream fuel,” the “momentum behind coal’s surge is ebbing away and the fuel faces a reversal of fortune,” the International Energy Agency declared in its 2015 Outlook report. But the end of the Blankenship era doesn’t mean his legacy, or that of Big Coal, will vanish from West Virginia anytime soon. Twenty-nine miners are still dead, as their relatives have pointed out. Mountaintops have been blown off, and watersheds polluted. Local economies are struggling to fill the void left by coal companies, which are doing their best to screw workers on their way out. The United Mine Workers of America has never really recovered, and so-called right-to-work legislation expected to be introduced during the next legislative session could finalize the union-busting that Blankenship made his name on. While the trial revealed Blankenship’s disregard for health and safety—jurors heard one recorded call in which Blankenship says, “Black lung is not an issue in this industry that is worth the effort they put into it”—it also exposed how far behind him the regulatory system lagged. “It was cheaper to pay the fines than the cost of preventing violations,” a former president of the Massey subsidiary that operated Upper Big Branch testified. There’s some speculation that the conviction will scare other energy companies into prioritizing safety; but West Virginia’s political establishment has little appetite for punishing other executives who endanger their workers. As Tim Murphy noted in a recent profile of Blankenship, the only real mine-safety regulation passed in the state since the Upper Big Branch disaster was a law requiring workers to take drug tests, though there was no connection between drug use and the explosion. There is, however, some evidence that the dangerous working conditions at mines like those Blankenship oversaw contributed to the opioid epidemic ravaging West Virginia. “Person after person interviewed” for a recent report on overdose deaths by the Charleston Gazette-Mail “mentioned job-related injuries as a reason why pain killers grabbed ahold of Appalachia first.” The issue came up somewhat accidentally during Blankenship’s trial, when the defense tried to discredit former Massey official David Hughart, who testified for the prosecution, by bringing up a drug-related arrest. Hughart explained that his addiction began with a painkiller prescription he was given after getting injured in a mine. For now, Blankenship is free on a $5 million bond he paid last year. According to his lawyers, he’ll appeal the ruling. Not on his own dime, mind you—his all-star defense team is paid by Alpha Natural Resources, the insolvent corporation that bought Massey soon after the King of Coal stepped down in 2010.